Celebrating St. Patrick's Day 2015 at Raglan Road | What's the Point? Welcome to those of you joining me from Disney Donna Kay and those of you just hopping aboard. I am the second stop on our Magical Blogorail. On this special Magical Blogorail loop, this Italian girl will tell you where you can have the luck of the Irish at Walt Disney World on St. Patrick's Day. 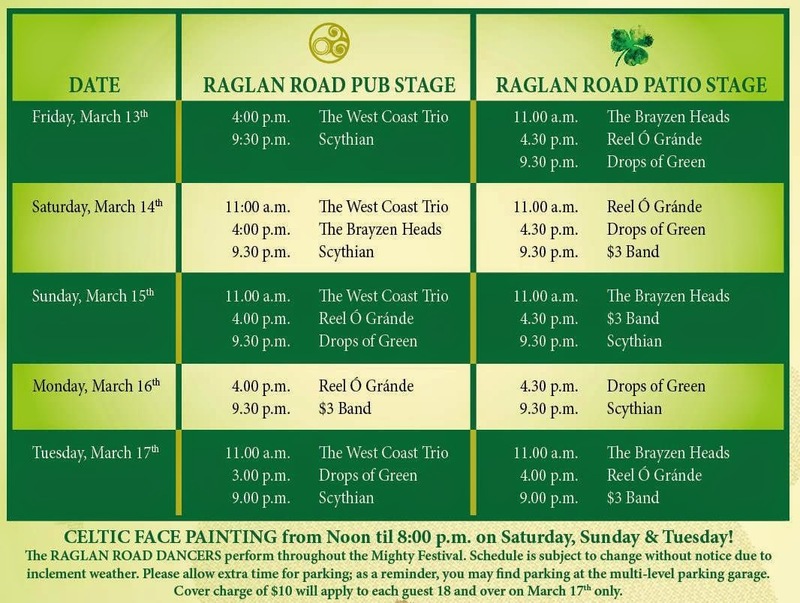 You cannot miss the Mighty St. Patrick's Day Fest at one of my favorite places on Walt Disney World Resort property - Raglan Road Irish pub in Downtown Disney. Raglan Road is a bright spot that has become a staple in my Disney World itineraries. In the past few years Raglan Road has delivered, in my opinion, in creating a very entertaining place where you can also get a good meal and a refreshing drink. At first glance you will notice that Raglan Road is quite large! There is seating on the inside and outside of the building, so on those cool winter nights do not hesitate to ask for a table outside. (For those extra-cool nights, there are space heaters on the outside patio) In a rush? There is counter-service fish and chips on the side of the restaurant. 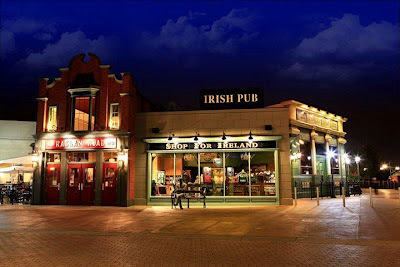 On the inside of the restaurant, you will notice an Irish flare, with dark wood and Celtic influences. Heading to Walt Disney World shortly? 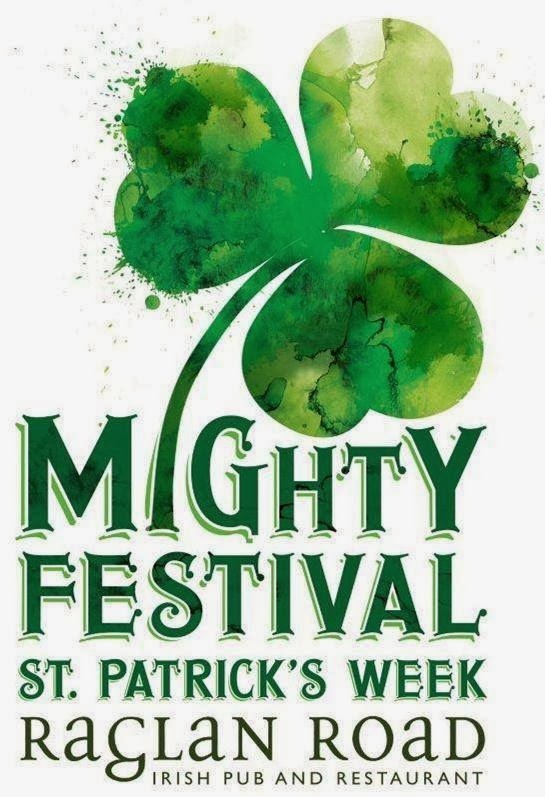 Well the timing of this post is perfect because Raglan Road's 2015 Mighty St. Patrick's Festival is running March 13 through March 17. You can RSVP via the Raglan Road Orlando Facebook page. The food is just one part of what makes Raglan Road so special. 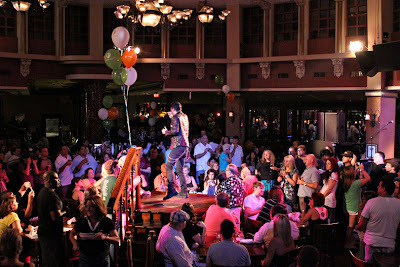 The entertainment is what really makes Raglan Road a hot spot. 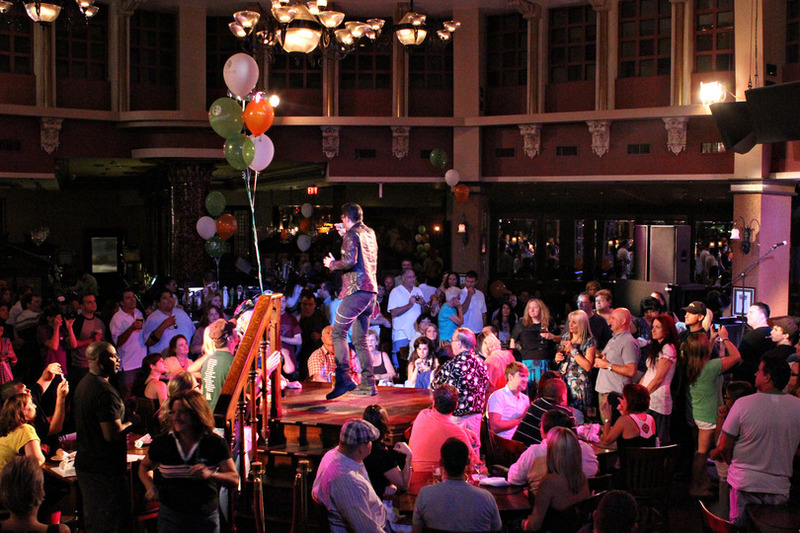 Right in the center of the restaurant is a stage where authentic Irish performers are featured. 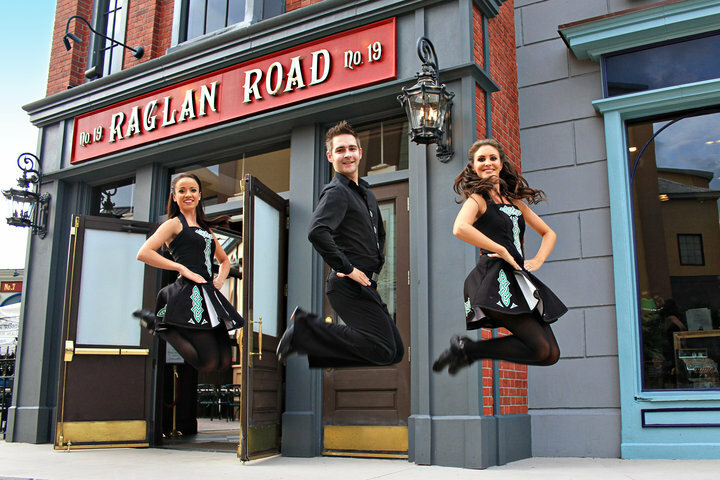 From Irish bands in kilts to a fabulous Irish step-dancer that performs nightly, you will never be bored while dining at Raglan Road. During the Mighty St. Patrick's Festival, they have an amazing lineup of performers every night. Finally, what is a St. Patrick's Day celebration restaurant without a well-stocked bar? The bar at Raglan Road features imported, domestic and local draught beer, your typical bottled beer and a pretty extensive list of craft beer. For those of you who like to sample, be sure to ask about their beer flights. In addition to beer, the bar also features a comprehensive whiskey and wine list. Happy St. Patrick's Day from The Disney Point! This sounds great! I'v never eaten at Raglan Road is it hard to get reservations? Also, can I use the Disney Dining Plan there? Great information, Rosanne! Thanks for sharing it with us! We skipped Raglan Road on our last trip, worried that it would be too loud for our sensory-sensitive kids. Would you recommend it for families, or is it more of an adult-oriented place? Karen and I don't usually hit the restaurants in DTD, but Raglan Road sounds to good to miss! Thanks for the tips. We love, love, love Raglan Road! 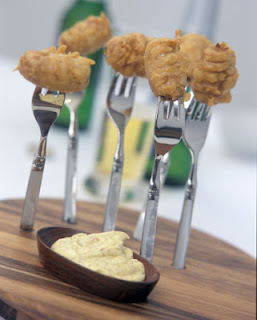 I cracked up the first time we ordered the Dalkey Duo and it was served on those forks--very interesting & very tasty! I never really thought of the indoor stages as being separate, but I guess they are, and yes, I have seen entertainers both indoors and outdoors all year round, day and night! I've only been to Raglan Road once and wasn't impressed - I ordered a risotto and it wasn't quite cooked... but I'd be willing to give it another shot - especially with all the entertainment and that duo does sound delicious! Raglan Road sounds like the perfect place to go for St. Patty's Day! Those dancers look so cool! Favorite restaurant! What is your favorite thing to order? We'll be eating there for the first time on our next trip.We'll be going for brunch.It looks like a ton of fun, even for this Italian girl ;). Awesome Lisa! As you may guess, I am (very) Italian and I LOVE it! Lin, I'm most definitely a shepherd's pie girl! They really are entertaining Kimberly! I think you should give it another shot Jennifer! I think that may have just been an off night. If you do go back, let me know what you think! Me too Jodi! It's so funny but amazingly tasty! Next time I'm in Downtown Disney, please come meet me for a drink and a Duo! They do Mary! It's truly entertaining. If you are there to see the stage shows, be sure to ask the seating host to seat you close to the center of the restaurant! It's definitely worth the wait. You're very welcome Lee. It's worth a try the next time you're in the area. It is a bar, but it definitely can be a good place for kids. If you are worried about it being too loud, ask the seating host to sit you to the outside of the restaurant. Some areas are so far away from the center of the action, it would be a good place to start. If the kids aren't frightened or if their sensory issues aren't affected, then maybe you can venture to see the entertainment. Thanks Mike! Hope we can go together one day! I'm with you Rosanne, this restaurant is a staple for my family as well. We're Irish, so we feel it is mandatory.) Luckily, Raglan Road is one of the BEST Irish hot spots outside of New York City. I also agree that although the food and drink is top notch, it is the stellar entertainment that sets it apart. Do you find yourself purposely strolling past their patio in the hopes of catching an act??! Updates to Soarin' and Toy Story Mania!